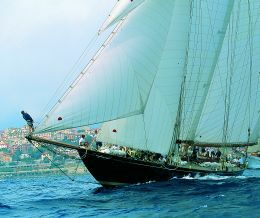 Argentario, Imperia, Porto Cervo, Cannes, St. Tropez, Palma: these are the places where you can usually find the great blue schooner as she races, always with all sails up, the crew tense, the skipper attentive, the owner at the helm. In effect this contrasts somewhat with the current idea of schooners as tranquil vessels, very seaworthy but without great competitive aspirations. Yet if we go back to the origins, in spite of the probable birth of schooners in Holland around the 17th century, we find in the 19th century, on the east coast of the United States, whole fleets of schooners rushing to the Newfoundland Banks, certainly not for pleasure but to arrive first on the fishing grounds and therefore on the markets. There were also sporting challenges between broad and shallow schooners with increasingly fine extremities and with increasingly greater thrust and sail area. Sail area: 749.80 sq. m.
If on the one hand the stimulus of speed and the consequent extremes of hull and sails led in those years to risking ship and crew, it also created the background from which the great American designers drew the lines of their schooners. And it should not be forgotten that in the DNA of this rig there is the pride of having created the Hundred Guineas Cup myth: America, the first winner in 1851, was a schooner! At the beginning of the 20th century Nat Herreshoff of Bristol, Rhode Island, drawing on all this and on his America's Cup experience (six winning vessels!) designed a series of beautiful schooners, seaworthy and fast for racing but also elegant in order to best represent the high social position of their owners. Mariette was part of this fleet, together with her sister ship Vagrant, owned by Harold S. Vanderbilt, and the famous Westward. Built for Frederick J.Brown, Mariette changed owner and name after twelve years, this steed of the seas becoming Cleopatra's Barge. Her long period with this owner, Francis K. Crowninshield, ended with the second world war when the boat, requisitioned by the American Navy, used as a coastguard vessel and then sold, began an inevitable decline which, after thirty years of charters and wanderings, actually brought her to risking demolition in a hulk cemetery in the Caribbean. Her beauty certainly did not go unnoticed at the beginning of the classic nouvelle vague of the 80's. 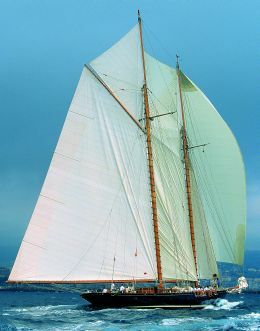 Recovered and brought to Italy, the schooner underwent a first restoration at the Beconcini Shipyard in La Spezia: much of the interior, including the famous original walnut panelling in the saloon, was in good condition and therefore saved, while the rig became staysail schooner, which is to say with staysails in place of the fore-trysail, certainly easier to handle with a small crew but far less beautiful than the original fore-and-aft. Noticed and purchased in '94 by the American Thomas J. Perkins who already owned important modern vessels but wanted to measure himself against the classics, Mariette returned to Beconcini for the final restoration. Though the steel hull seemed to have been little affected by its many vicissitudes, the teak deck on metal beams had to be completely redone. The hydraulic and electrical systems underwent radical renovation and two new 150 HP Caterpillars were installed. The deck equipment, all in modern stainless steel, was redone in accordance with the dictates and materials of the period. Tom Eaton, the captain of Puritan, another famous schooner, was engaged to supervise this demanding restoration. Eaton's job was to supervise, among other things, Mariette's return to her original rig. Nat Herreshoff's drawings were fortunately still in existence, kept at the Massachusetts Institute of Technology. On the basis of these the masting was completely redone by Harry Spencer, Isle of Wight, with the use of Douglas fir for the lower masts and bowsprit and spruce for gaffs, spars and everything working high up. Ratsey and Lapthorn supplied the sail wardrobe: mainsail, foresail, two gaff-topsails, fisherman, MTS, jib, staysail and jib topsail, all handmade in ivory coloured Dacron to create the 750 square metres of propulsive area. Mariette's interior had always been fairly well preserved, so restoration was limited to philologically readapting what had been changed over the years. 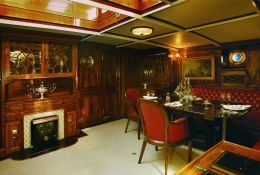 It was Charlie Wroe, the current captain, who took me to see this marvellous full beam saloon where walnut panels frame capitonné leather sofas in the reading area and around the dining room and fireplace. 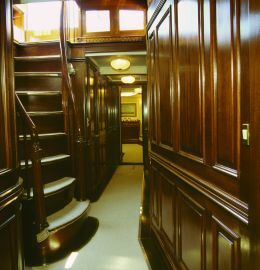 The soft curve of the stairway in mahogany joins the couloir that leads to the navigation cabin, to the twin cabins for guests and to the owner's suite. 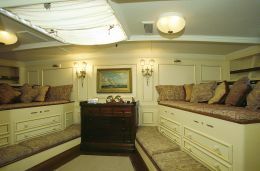 Here, unlike the rest of the boat, the dominant shade is light: white panels illuminate the two bulkhead fitted beds, mahogany furniture, period fittings and private bathroom with the tub set in wood. The owner's study is adjacent but separate. Forward of the wardroom there is a functional galley and then, in sequence, cabins for the captain, officers and crew. As for the handling and the logistics of the schooner while racing, because Mariette is, in a word, rigged to run, Charlie Wroe explained that performance certainly depends on the helmsman, normally Mr. Perkins, and on the skipper, but another important factor is synchronisation of the thirty man crew in the complicated manoeuvres of tacking and gybing. A certain simplification is achieved by keeping the foretopsail aloft when going about, and obviously the jackyard topsail, although this requires two men on the masts to pass the tack downwind. The fisherman (replaced by the MTS in fresher winds), which is to say the flying sail between the masts, has to be tacked by striking it each time and hoisting it on the other tack. The two gaff-topsails are struck when the wind exceeds 25 knots, although the precise limit depends on the waves. With a stiff breeze and a calm sea, for example at Argentario or in Sardinia, Mariette offers a real spectacle of power: all sail clapped on, the crew leaning out upwind, 15 knots, the apotheosis of sailing! When the weather gets really rough the mainsail, jib top and jib are also struck and you sail safe and dry under foresail and staysail: in this way the schooner handles the furious mistrals in the Gulf of Lyons. However, the cruising mainsails (Mariette has a set of 38 sails including those for racing) can be reefed for more tranquil sailing. 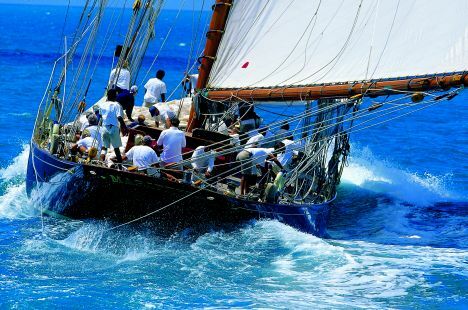 On entering the classic racing circuit Mariette found worthy rivals awaiting her - Puritan, Altair, Aello, the ketch Thendara, The Lady Anne and Tuiga - and she began a happy season of races that is still going on, in which the splendid blue schooner always gains high positions on the podium.